ComputerImages is in downtown Boston at 15 Court Square, Suite 530. Court Square is a small block that opens onto Court Street and surrounds a classical style office building. We are one block from City Hall and Government Center. See map below or follow link to Google Maps. Our office is very close to each of the four subway lines; about one block from Government Center and State Street, three blocks from Downtown Crossing. (MBTA subway map). Blue or Orange Line. Go to State Street station. When you leave the station, go to the corner of Washington and State Streets. State Street changes its name to Court Street at this point. 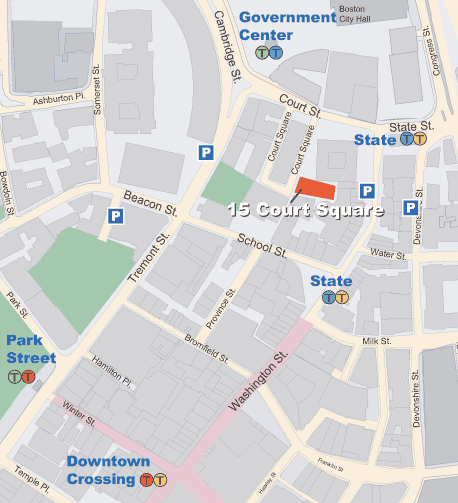 Walk on Court Street in front of 1 Boston Place (a dark forty-story building) and turn left at the first cross street onto Court Square. Our building is on the left. (MBTA Blue or Orange Line Info). Green Line. Go to Park Street station. Walk on Tremont toward Park Street Church (on corner). Continue past Suffolk Law School (on right) to Parker House Hotel (on right) where Tremont crosses Beacon and School Streets. Turn right onto School. Continue past Old City Hall (on left) to Starbucks and pedestrian walkway (on left) called City Hall Avenue. Go left onto City Hall Avenue. We are in the older, 11 story building on right with four lanterns in front. (MBTA Green Line Info). Red Line. Go to Downtown Crossing station. Then walk on Washington Street toward City Hall. When you get to Walgreens, turn left onto School Street, and then turn right at Starbucks. This takes you to a pedestrian walkway which leads right to our front door. (MBTA Red Line Info). Check the MBTA web site for schedule and route information from your town. Some lines go to South Station in Boston; others to North Station. The following are directions from those stations to our office. From South Station. Take Red Line one stop to Downtown Crossing station and follow walking directions given for that station in subway section. From North Station. From North Station, take Green Line subway inbound for two stops to Government Center. See "Subway" section for walking directions from the Government Center station. There are a number of garages in the area (garage list). On-street parking is typically difficult to find and parking restrictions are strictly enforced. The SmartTraveler web site provides traffic condition reports. From the West. Storrow Drive to Charles Street exit. At light, right onto Charles Street. Continue to end, then left onto Beacon Street. With Boston Common on right, continue past State House (on left). Beacon becomes School Street at Tremont. At end of School, left onto Washington. Go to end of street, left onto Court Street and left again into Court Square. From the North. Take Route 1 or Interstate 93 south. As you pass Fleet Center, take Exit 25 (Haymarket Square, Government Center). At bottom of ramp, go straight on New Charendon Street to first cross street. Left under Government Center garage (1 Congress Street). Continue on Congress past City Hall (on right). At next light, go right onto State Street. State becomes Court Street at first light. First left after light is Court Square. From the South. Interstate 93 or Route 3 (Southeast Expressway) north. Entering downtown, road dips into tunnel. Immediately at tunnel’s end, take Exit 22 (Atlantic Ave., Northern Ave.). Go left onto Atlantic. Look for left turn onto High and Broad Streets. Take turn, then go straight on High Street past International Place to Pearl Street. Turn right onto Pearl. Continue past Post Office Square until Pearl merges with Congress. Take Congress to State, turn left. At next light State becomes Court Street. Court Square is first left after light. events that have occurred in our historic neighborhood. © Copyright 2017, 1995, ComputerImages. All rights reserved. Directions to ComputerImages, Updated October 12, 2017.